We analyzed every super bowl campaign using the BrandTotal platform. Here’s what we found. 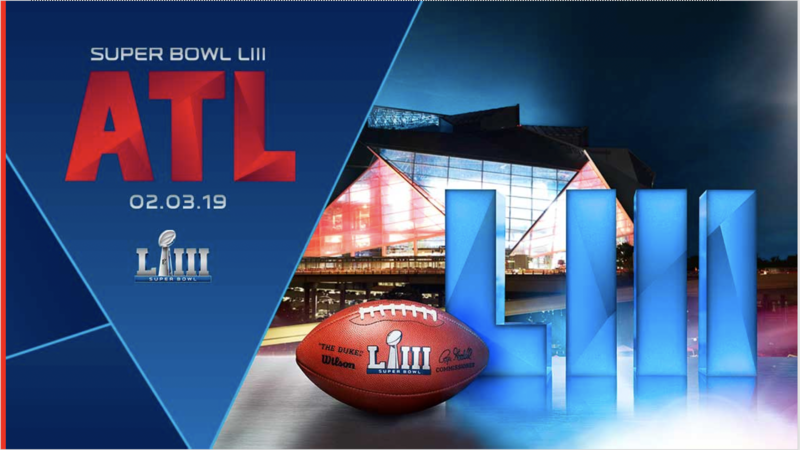 While the 2019 Super Bowl was one of the lowest scoring in history (Patriots - 13, Rams - 3), in many ways this past weekend was nothing out of the ordinary: the Patriots won, Tom Brady solidified his claim to throne, and the world’s largest brands were able to display their creative prowess. We ran an analysis to understand how the advertisers distributed their commercials online to complement their prime-time, million dollar TV spots. 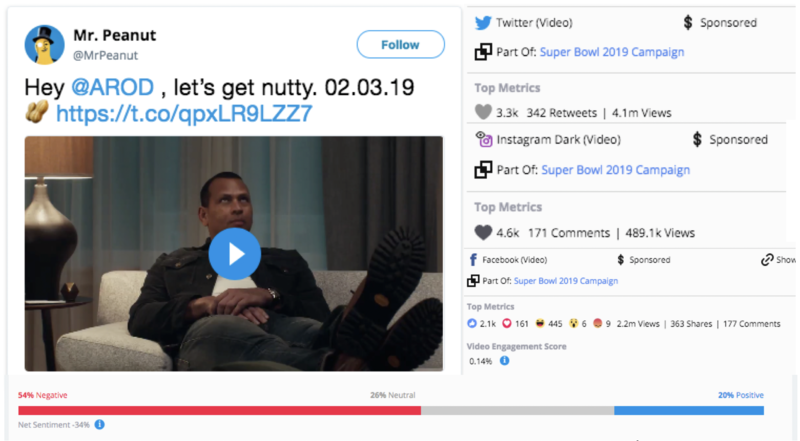 Because brands can’t see people sitting in their living rooms reacting to a Super Bowl ad (yet), these digital placements serve as a sounding board, or a proxy to get a clearer, more detailed picture of the audiences’ response measured by engagements across demographics and by response sentiment. If you paid attention, you may have noticed the arguably excessive amount of robots in this year’s ads across all companies and industries. Robert Klara at AdWeek explains the robot phenomenon as a tipping point of America’s reconciliation with AI. As a whole, he says, Americans are starting to get used to the presence of artificial intelligence, if not robots proper, in their lives, and so robots are trending. That said, he points that for the many people who haven’t yet reached the tipping point, robots still symbolize anxiety over job replacement, general fear of the future, and discomfort with the blurring line between person and machine. Samantha Poggi at AdAge argues that brands included the robots because they acknowledge this anxiety, and the commercials are meant to assuage it. Intuit’s TurboTax and Amazon’s Alexa commercials for example, demonstrate how these robots sometimes don’t hit their marks. According to our numbers, they’re both right. Robert Klara was right when it came to TurboTax’s commercial, which placed on YouTube as dark sponsored posts - hello Dark Marketing! The ads demonstrated a 65% negative sentiment across approximately 1,400 comments, with a 5% increase over the last seven days. Even then, comments were graded 28% neutral sentiment, leaving TurboTax with a mere 7% of positive comments. That’s a pretty poor sentiment score compared to metrics of other advertisers like Budweiser and M&M’s (see below). Key Metric: Sentiment Score TurboTax’s positive sentiment score experienced a 5% decrease over the first 7 days from the launch of the campaign, as compared to the previous 90 days, before the campaign appeared. Amazon’s “Not Everything Makes the Cut,” campaign, saw moderate success. The up-like to down-like ratio was great, with 17 likes for every 1 dislike. That said, there was a net -8% sentiment score across the approximately 1,000 comments. Perhaps the lukewarm reception has to do with the fact that unlike TurboTax, there was no robot resembling a human, speaking to the factor of anxiety people are supposedly feeling. Key Metric: Dark Ad Impressions This dark ad experienced 41.7m views on Facebook alone as part of Amazon’s sponsored post campaigns. This ad also has achieved an organic viral score of 84.38%, an extremely high score for a sponsored post. We found this interesting, because for advertisers who chose to buck the robot trend and stick with man’s first best friend, like WeatherTech, Avocados from Mexico, and Budweiser, their ads had tremendous success. WeatherTech, a company that manufactures protective mats for car-floors, (someone has to make them! ), created a new vertical for pet products - and their campaigns unsurprisingly featured some pretty cute pets. Comments including the word “commercial” had an overall 75% positive sentiment and 12% neutral - which is great news for their creative teams. Key Metric: Dogs WeatherTech's ad featuring a dog as a main focus received a ton of positive sentiment, specifically toward the word "commercial"
While impact investing firms and brands around the world are considering how sustainability efforts improve brand sentiment among all stakeholders--customers as well as their investors and people across their supply chain--this year’s Super Bowl ads have shown us one thing: people generally respond well to brands doing good. Budweiser especially gets an A+ for their Wind Never Felt Better campaign, featuring the brand’s wind-energy powered brewing process. For starters, the ad went viral, with an organic share rate of 26.54% across 3.5 million views, or 910K shares. For just about any ad, that’s tremendous for brand awareness, not to mention an efficient use of ad dollars. Also, a majority of the comments on the ads had a positive or neutral sentiment - at 63%. Top positive words were “beer”, “Budweiser”, “clydesdale,” “horse”, and “dog”. Olay also tested out experimenting with gender inclusivity with their #FaceAnything campaign. While they fell into the AI trend, their Killer Skin campaign features Sarah Michelle Gellar unable to unlock her phone’s Face ID because her youthful skin is unrecognizable, thanks to Olay facial cream. This ad campaign’s media mix had 55% on Instagram, was targeted almost exclusively toward women, who made up 96% of Olay’s online audience -- 70% of which were over the age of 45. In an Instagram post, @Olay posted that while 45% of Super Bowl fans are women, 23% of commercials feature them. Olay’s proclaimed that they’re “here to change that.” - and their ad targeting is in clear support of that message. While using famous people in ad campaigns is hardly a new invention--we just call them “influencers” now-- commenting, engaging, and sharing those ads is (relatively) new, giving people with the power to dramatically shift the needle on any campaign’s impact. It turns out, everyone loves Christina Applegate. The M&M’s campaign, distributed most heavily on YouTube and Instagram, features Applegate as a mom threatening to eat her M&M “kids” alive. It’s hilarious, and the comments reflect it: with 86% positive sentiment across all platforms, this ad was largely targeted to people around 25-34 (at 33%), or young parents dealing with young, arguing kids. Key Metric: Media Mix Youtube and Instagram played a large role in the brand’s targeting strategy - making 88% of their platform allocation - which makes sense, since the data shows they were looking to reach young audiences, age 19-34. Doritos played toward millennial (and possibly Gen-X?) 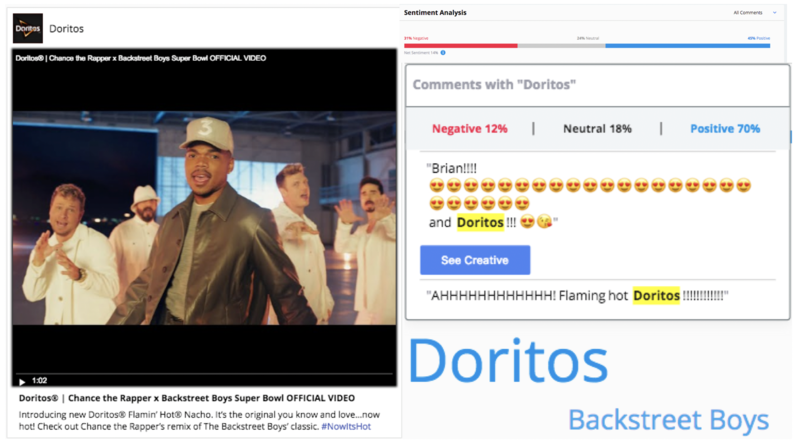 nostalgia with their Backstreet Boys ads, where comments with the word “Brian,” referring to Brian Littrell, the most talented of the group, (don’t @ us) and “Doritos” saw 70% positive sentiment, which is a clear indication for brand lift. Stella Artois’ feature of Carrie Bradshaw (SJP) and The Dude (Jeff Bridges), experienced tremendous organic success on Facebook, with 97% organic engagements, or 23.5K shares. While these ratios rival Budweiser’s, the raw share numbers were lower. Either way, both brands reaped a great use of their ad spend. Key Metric: Organic Viral Score This ad experienced a 97.94% organic viral score on Facebook. The brand published it on their public feed, and it snowballed into a viral sensation, without having to put much marketing budget behind it. At the time of this posting, the ad was seen 14.2m times! ‍Bumble’s feature of Serena Williams also had a high organic share rate at 26%, and 2Chainz/Adam Scott in Expensify’s commercial led to overall 63% positive sentiment in comments. Key Metric: Positive Sentiment Early sentiment toward this ad featuring 2Chainz and Adam Scott has been significantly positive, 6 hours from when the campaign was launched online. 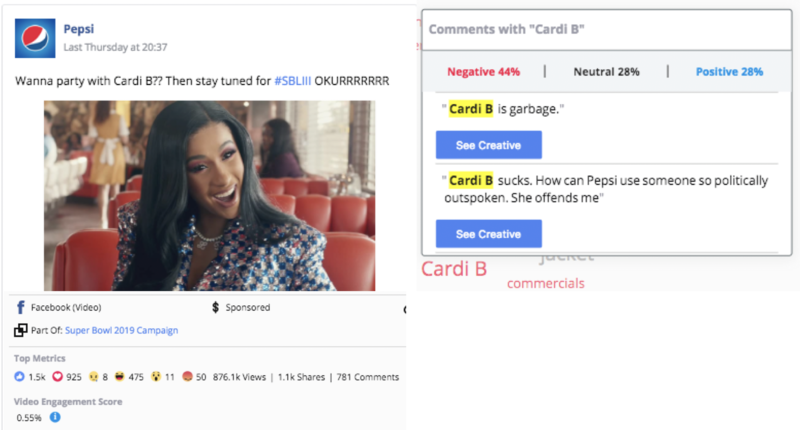 Key Metric: Negative Sentiment This ad is receiving a significant amount of negative sentiment - mostly directed toward Cardi B. Also, Planter’s Peanuts may have found that using Alex Rodriguez, a Yankees player accused of performance enhancing drugs is not ideal. The campaign experienced a 54% negative sentiment and -34% overall net sentiment, distributed fairly evenly across Twitter, Facebook, YouTube, and Instagram. From this year’s Super Bowl, we’ve learned that influencers can be a risky business, and dogs continue to go undefeated. Check back for more coverage on the latest and greatest marketing campaigns. If you’re interested in marketing data just like this, contact us.